60 Minutes Reports | The Storm after the Storm | Denis G. Kelly & Associates, P.C. Sharyn Alfonsi investigates allegations that thousands of homeowners were denied their flood insurance claims after Hurricane Sandy because of fraudulent engineers’ reports. The following is a script from “The Storm after the Storm” which aired on March 1, 2015. Sharyn Alfonsi is the correspondent. Oriana Zill de Granados and Michael Rey, producers. When Hurricane Sandy made its way towards the East Coast in the fall of 2012, residents knew it could be devastating. What they didn’t expect was just how bad Sandy turned out to be: 117 deaths, and damage estimated at more than $60 billion, second only to Katrina. Now two and a half years later, Sandy victims have been hit by something else they didn’t expect, the storm after the storm. Many of them say they have been cheated out of their insurance claims. Thousands of claims have still not been resolved and there is evidence that many homeowners were victims of what appears to be wide-scale fraud where original damage reports were later changed to make it look like the damage wasn’t as bad. Making matters worse, appeals to the federal agency in charge of all of this, FEMA, went nowhere. Hurricane Sandy damaged or destroyed hundreds of thousands of homes and rearranged neighborhoods. Long Beach, New York, was one of them. This was Bob Kaible’s house the next day. The yellow one, with a sand dune blocking his front door. Bob Kaible: The beaches decided that they didn’t want to be there anymore and they came to pay a visit. And that’s what happened. And we got back to the house and we were devastated. Sharyn Alfonsi: What was that like to walk into your house for the first time? Bob Kaible: Everything that you worked so hard in your life to get is now gone. Sharyn Alfonsi: But you had flood insurance? Sharyn Alfonsi: You’d pay for every month? Sharyn Alfonsi: Did you think you were OK? Bob Kaible: Sure. You– I mean that’s what you pay insurance for. The city condemned Kaible’s home, saying it was damaged beyond repair. The house had been knocked off its foundation. His insurance company, Wright Flood, sent an engineer to inspect the damage. Three weeks later, the Kaibles couldn’t have been more surprised. Bob Kaible: I get the engineering report that there’s no structural damage to the house. So I’m going like, “What do you mean there’s no structural damage? The house is not what it was before.” So between my wife and myself we made about 30 to 40 phone calls to different people. The adjuster. The engineering firm. To our flood insurance carrier. Sharyn Alfonsi: What are you trying to get from them? Bob Kaible: Just that this report is wrong. We’d like to get another engineer back. The insurance company agreed to send someone back out to the house. Surprisingly, it was the same engineer, George Hernemar, who worked for a company called U.S. Forensic. Bob Kaible got out his phone and took a picture of George’s original report. It plainly said there was “structural damage” to the house. But this is the report the insurance company sent to Kaible when they denied his claim. 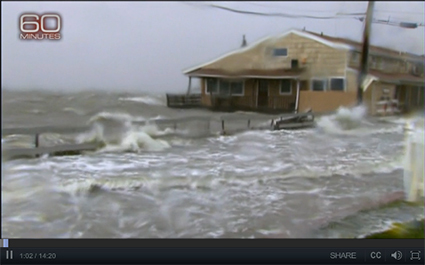 Quote “not structurally damaged.” They said the damage was “long term”… meaning it existed before Hurricane Sandy. The Kaible’s insurance company, Wright Flood, the largest provider of flood insurance in the country, paid him just $79,000 dollars of his $250,000 policy. Bob Kaible: We had a mortgage on the house. I’ve had estimates of $300-350,000 to rebuild the house. What am I gonna do? Bob Kaible’s house was torn down after he sold it for a loss and he believes it was because of a falsified engineering report. The photo Kaible took was solid proof for many other Sandy victims who were struggling with similar situations. Sharyn Alfonsi: How many houses do you see that are empty? Bob Kaible: On this block? Probably half of ‘em. The Kaible’s pleaded to a vice president at their insurance company and passed on their evidence. But the company denied full payment arguing subsequent reports supported them. With frustration as high as the watermarks in their home the Kaible’s filed a lawsuit. That suit drew the attention of a Texas trial lawyer who had never been to Long Beach, but got on his plane in a hurry. Steve Mostyn has won billions fighting insurance companies and when he heard about Bob Kaible’s case he says he had a gut-feeling the Kaible family wasn’t alone. Sure enough, he says his Houston office is now flooded with paperwork from victims of the superstorm. Steve Mostyn: There’s been systematic fraud on the policyholders who’ve filed flood claims from Sandy. Sharyn Alfonsi: What’s the fraud? Steve Mostyn: The fraud is taking engineers’ reports and changing them from saying there was structural damage to saying there’s no structural damage, or giving the engineers a form to fill out that already has the conclusion of no structural damage. Sharyn Alfonsi: Why would anyone do that? Steve Mostyn: Save money. The biggest ticket item inside a claim, for a flood claim, is the structural damage. And so when they don’t pay for structural damage, they save hundreds of thousands of dollars on each claim. Of the thousands of cases lawyer Steve Mostyn says he’s found, electrician John Mero and his wife Gail’s is the most revealing. Their house is in East Rockaway, New York. Sharyn Alfonsi: What was this street like in the days, the day after Sandy? Gail Mero: Six-foot-high water in the street. John Mero: Well, the day after, it was like Armageddon. The Mero’s house had to be torn down after the storm. Their insurance company paid them just $80,000 and now they’re buried in debt after rebuilding their home. It was two years later that the Meros felt a second wave hit them, when the engineer who assessed their home after the storm called them out of the blue. John Mero: The engineer sent his report in to the insurance company saying that the house was damaged due to flood. The structural damage is caused by the flood. And from what I understand, the insurance company changed it, changed his words, without him knowing. This is Andrew Braum, the engineer who could no longer stay silent. Andrew Braum: I wanted to call them from day one. I wanted to tell them that this is not me. I didn’t do this. Braum told us not only were changes made to his engineering reports, but he was asked to cover it up. He showed us the original report he’d written about the damage to John and Gail Mero’s house. Andrew Braum: We assess in the conclusions hydrodynamic forces, hydrostatic forces due to the flood, caused a cracking and shifting throughout the foundation. Sharyn Alfonsi: So you’re saying the flood caused this damage? Andrew Braum: Correct. And then, in the revised or the altered report, it says, “Settlement due to consolidation of soil caused the foundation wall to crack.” That’s not what I wrote. It’s completely altered. Braum inspected more than 180 homes after Sandy, working for a company called HiRise Engineering. After he discovered the changes made to the report he wrote about the Mero’s home, he went back to check all the copies of his original reports against the final copies that the homeowners received. Sharyn Alfonsi: How many of those reports were doctored? Andrew Braum: At least 175 of them or approximately 96 percent is the number that I calculated. Sharyn Alfonsi: A hundred and seventy-five of your reports were doctored? Andrew Braum: Correct. They were altered. Sharyn Alfonsi: And the ones that weren’t changed? Andrew Braum: The one’s that weren’t changed, interestingly, were ones where I recommended that no repairs are required. Braum says HiRise Engineering pressured him to sign an affidavit saying he agreed with their final reports. He says he ignored the request and never did it. Sharyn Alfonsi: Do you think they were trying to cover up something? Andrew Braum: Now, knowing what I know, yes. Sharyn Alfonsi: What do you think was going on? Andrew Braum: They figured out that they altered all those reports. And they wanted to hurry up and have, they called me Braum, “Braum, get Braum to sign off on this quick.” So if Braum wasn’t thinking or if Braum didn’t care, he would just sign his name 200-something times, and they were off the hook. And that wasn’t happening with me. Insurance companies have argued the reason the engineering reports were changed was to allow for a peer review process — a standard practice in the insurance industry. Andrew Braum: Peer review to me would be amongst my peers of an equal-licensing or education level and review a report and discuss it. But not peer review when I send my final report and it’s changed without my knowledge. That’s not peer review. Just days ago the offices of HiRise Engineering were raided by the New York attorney general’s office, which is conducting a criminal investigation into HiRise as well as the insurance companies that hired them. HiRise, Wright Rlood, and U.S. Forensic all declined our requests for an interview. They have denied allegations of criminal activity and all three say they are cooperating with the investigation. More than 2,000 Sandy victims have filed lawsuits in federal courts. Steve Mostyn: You know we thought originally it might be one engineer, right. And then we find multiple engineers inside the same company. And as we dug into it, it’s other engineering companies, well, then you gotta start looking for a different common denominator. And in this case, all of those companies are overseen by FEMA, the Federal Emergency Management Agency. More than 5 million homeowners living in designated flood zones all around the country are required to buy flood insurance policies backed by FEMA and taxpayer money. Brad Kieserman is the new head of FEMA’s flood program. On the job for about three weeks, he’s already had to answer to allegations of fraud and criminal activity at the expense of some of Sandy’s hardest-hit families. Brad Kieserman: I’m not gonna sit here and conceal the fact that it happened. ‘Cause in the last three weeks, I’ve seen evidence of it. Sharyn Alfonsi: You say you’ve seen evidence of these fraudulent reports? Sharyn Alfonsi: You’ve seen evidence of what could be criminal activity by using unlicensed engineers? Brad Kieserman: Yes, which is why I referred it to the inspector general. Sharyn Alfonsi: When did FEMA learn that there may be a problem here, that fraudulent reports may be used to deny claims? Sharyn Alfonsi: –in– in the summer of 2013. Brad Kieserman: So– you’re right. This is dated August 19th, 2013. And, you know, I’ve seen this. The document, sent to FEMA, was an appeal from another family who felt badly cheated by their insurance company. In it, they provide proof that the engineer who inspected their home, working for the firm U.S. Forensic, was not licensed to work in New York. Sharyn Alfonsi: Why wasn’t it elevated in the agency? I mean, this to me is the type of thing you run to the boss with. Brad Kieserman: This would be the type of thing that I would run to the boss with. And I need to find out why that didn’t happen. Brad Kieserman: As far as I know, no one at FEMA has ever done that. But lawyers paid for by FEMA have gone after Sandy survivors in court, accusing them of fraud. Bob Kaible, who took the photo of his altered engineering report, was accused in court of stealing the report done on his own home, which he denies. Sharyn Alfonsi: We have homeowners who went through the appeals process. And the attorneys who are being paid for by FEMA called them thieves, said they were trying to conduct fraud. Those are your dogs at the end of the leash. Do you take any responsibility for that? Brad Kieserman: Yes, I take responsibility for the fact that when FEMA funds activities, the people who are getting paid by those funds need to behave in a professional, ethical manner. Two and a half years after Sandy, neighborhoods still bare the scars of the storm, but settlement talks are now underway. A week ago, FEMA’s Brad Kieserman and a team of attorneys flew to Texas to meet with Steve Mostyn to begin negotiations to settle more than 2,000 Sandy claims. Sharyn Alfonsi: These people are truck drivers, nurses, firefighters. They said they fought as much as they could. And they feel like FEMA just gutted them. They just gutted them. Brad Kieserman: The fact that that’s the experience they had with their insurance companies, their engineers, their adjusters in a FEMA-funded program, that’s unacceptable. Sharyn Alfonsi: So are you gonna make it right? Brad Kieserman: I am. As you know, I’m doing everything I can in the midst of negotiations to try to make that right. Let’s face it. I don’t have unlimited authority. I can’t wave a magic wand and make all of this right for everyone. Making it right for every victim of the fraud in the aftermath of Hurricane Sandy is the goal of oversight hearings that Senators Gillibrand and Schumer of New York and Menendez and Booker of New Jersey plan to call for tomorrow.